This is an 1833 Society for the Diffusion of Useful Knowledge or S.D.U.K. 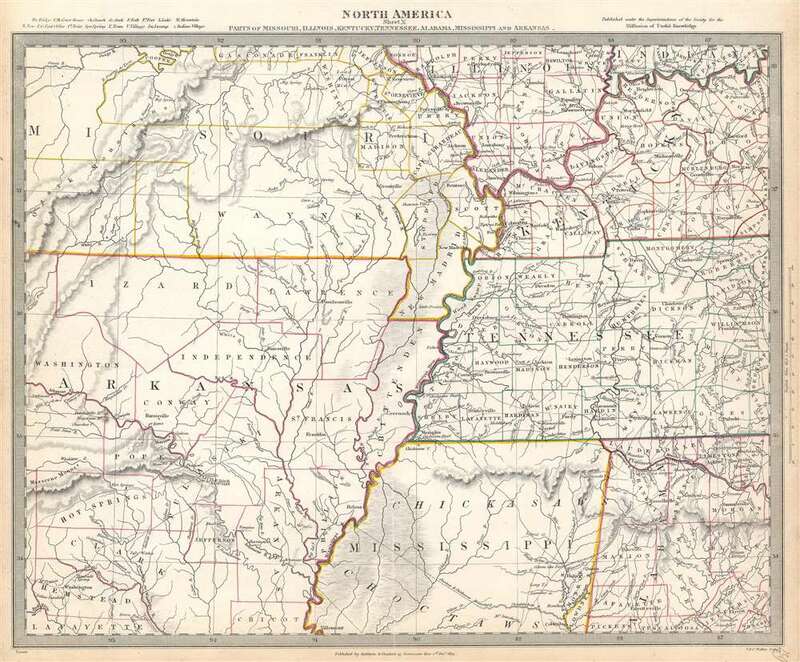 map of Arkansas, Missouri, Mississippi, Kentucky, Tennessee, Alabama and Illinois. The map depicts the region from the Ozark Mountains to Rome, Indiana and Huntsville, Alabama and from Mount Leansboro, Illinois to Columbus, Mississippi. The states are outlined in different colors to allow for easy differentiation, along with individual counties within each state, which are also labeled. Cities, towns, and villages are identified throughout, including Little Rock, Arkansas. Rivers, mountains, Indian villages, and topographical features are also noted throughout, with relief shown by hachure. The American Indian lands of the Chickasaws and the Choctaws are identified in northern Mississippi. Soon these lands would be organized by the Federal government into territories and eventually new states, a process which would eventually lead to the early 19th century displacement of the various indigenous peoples known as the Trail of Tears. This map is part of A Series of Maps, Modern and Ancient, issued by subscription. Each folder in the series would contain a set of two maps bound together. The original folders included the names of committee members of the ‘Society’, contents of numbers previously published, the folder number, the contents, and the printer and publication details. This map was engraved by the firm of John and Charles Walker and published by Baldwin and Cradock for the Society for the Diffusion of Useful Knowledge on Dec 1, 1833. Very good. Even overall toning. Light creasing. Blank on verso.